Providing you the best range of mil 5015 connectors, mil c 5015 connectors and circular connectors with effective & timely delivery. 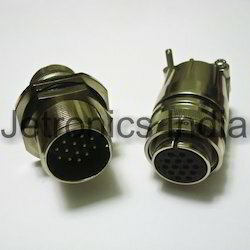 These are Connectors which follow the insert arrangements available under MIL 5015 specifications. These MIL 5015 connectors are made in aluminium shells and can withstand extreme environmental conditions. Are available upto 52 pins having varying current carrying capacity from 13A to 150A. 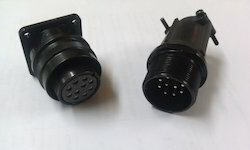 These connectors are capable to carrying both power and signal applications within the same connector. Also know by this name, MIL C 5015 Connectors are known for their supreme reliability, high power carrying capacity, their inherent ruggedness and capacity to withstand extreme environmental conditions. These connectors represent well proven electrical capability at an acceptable cost for most equipment where durability is important. 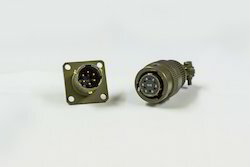 These connectors are miniature circular connectors following the insert arrangements available in MIL C 26482 Series I, These get coupled with 3 point bayonet coupling and also have 5 key polarization, resulting in firm locking and are widely used in various applications requiring quick connect arrangements and miniature size. Looking for MIL Connectors ?